Ideal dog e collar for you! The remote dog collar shock combines many of the features and elements commonly found in dog training collars but with a compact receiver design to accommodate a larger variety of dog sizes from up 10 pounds and up. This fully waterproof e-collar is very popular with the dog trainers and pet owners. Its training systems will help you to control and train your dog in effective range by a series of functions, including vibration alert, sound warning, electrostatic punishment, etc. With its remote design, you can remote bark stopping, running about correction, easy calling back, biting and fighting. It will be your good training assistant. 5.The remote has battery tip, The receiver has a low battery notice. 7.Normal Using Time: About 10 days, depends on how often you use. 11.Easy to operate and ergonomic Transmitter. 12.LCD Display for nighttime usage. 13.Light Mode to assist seeing dog in low light condition. ✪ Humane Harmless Dog Shock Collar: This is a effective dog shock collar for dogs for Expert Trainers & First Time Pet Owners. Can be used to help correct your dogs barking, walking, leash training, sitting, pee, aggression, and other behavioral obedience.Two sets of conductive covers to fit different hair length of dogs and ensure electric leakage protection and circuit protection so as to make training your dog safely and humanely. ✪ Three Training Modes&Separated Button : The dog training collar offers adjustable customized static shock (0-99) and vibration(0-99) levels, as well as a standard "Tone/Beep" mode. You can select the most suitable mode and level to help correct your dog inappropriate behaviors according to training and acceptance performance of the dog. The shock mode and vibration mode can be set separately. ✪ Waterproof and Rechargeable Design: The receiver of the shock collar is IP67 waterproof - it works well even if immersed in water - so your dog can swim or bath freely with the collar on(Note, the remote transmitter must be kept away from water). The receiver and transmitter can be charged at the same time through 2 in 1 charging cable. They can offer about up to 10 days use after 2 hours fully charging. ✪ Wireless Remote Control Electric Dog Collar: This dog training collar with remote provides a wireless wide range up to 550 yards, thus you can train your dog in park, backyard anywhere else easily and conveniently. The strap is adjustable, it fits all dogs, adjustable size: 4in~23nches. It's a ideal shock collar for small dogs, medium and large dogs. 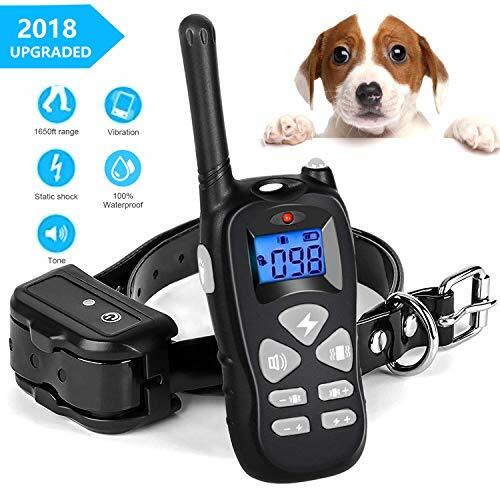 ✪ One Year Warranty: We offer 30 days 100% money back guarantee and 1 year warranty for this electric dog collar with remote. And if you have any question with the products, just contact us. "Yisence Tech", customer service within 24 hours.